Resilient Communities appeared on two panels and received a 2017 Technology Division Smart Cities Award at this year’s American Planning Association Convention, providing urban planners with learnings and experiences from the field in building cooperative local broadband networks. Program Manager Houman Saberi represented RC in a facilitated discussion of the three Smart Cities Award winners, describing our work with six Sandy-affected communities through the Resilient Networks NYC project. “In the future, we hope that our partners’ local WiFi networks are better known for the relationships and human connections they helped to build, not just for their technological achievement,” said Saberi. Resilient Communities Director Greta Byrum also spoke on a panel called “Future-Ready Cities,” which provided planners with the basics on how to plan and develop local broadband solutions. Byrum stressed that if municipalities or even neighborhoods build and own their own last-mile broadband infrastructure assets, they will have more power in the marketplace to cooperatively purchase backhaul (data) connections, and possibly even to set conditions around contracts with broadband providers, including privacy protections and pricing. 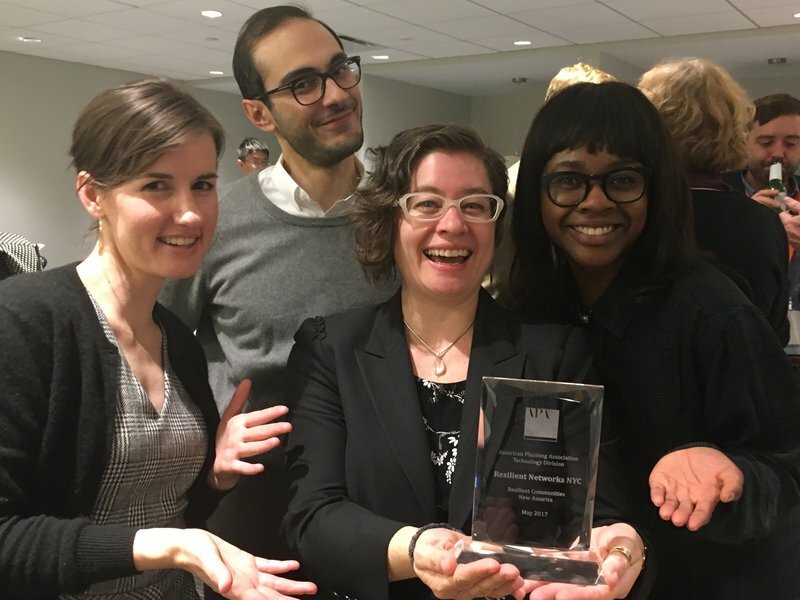 Resilient Networks NYC, the Resilient Communities program’s flagship project and the winner of the 2017 Smart Cities Planning award, is a multi-stakeholder partnership operating in six Superstorm Sandy-impacted neighborhoods to build and maintain local wireless networks. In each neighborhood, New America is supporting a local community organization training local residents as "Digital Stewards" to conduct outreach, work with local businesses and leaders, and design and install local public WiFi. We are grateful to the American Planning Association’s Tech Division for the recognition, to our funding partners at the New York City Economic Development Corporation’s RISE : NYC Program for their support, and to our local partners who have worked with us throughout the Design phase of the project: The Point CDC, Fifth Avenue Committee, the Rockaway Development and Revitalization Corporation, Silicon Harlem, Kings Bay Y, and Project Hospitality.